Arguably better than any of the Giant builders, Toll Brothers built a business that was ready to absorb and pivot from the historic downturn to a new market. 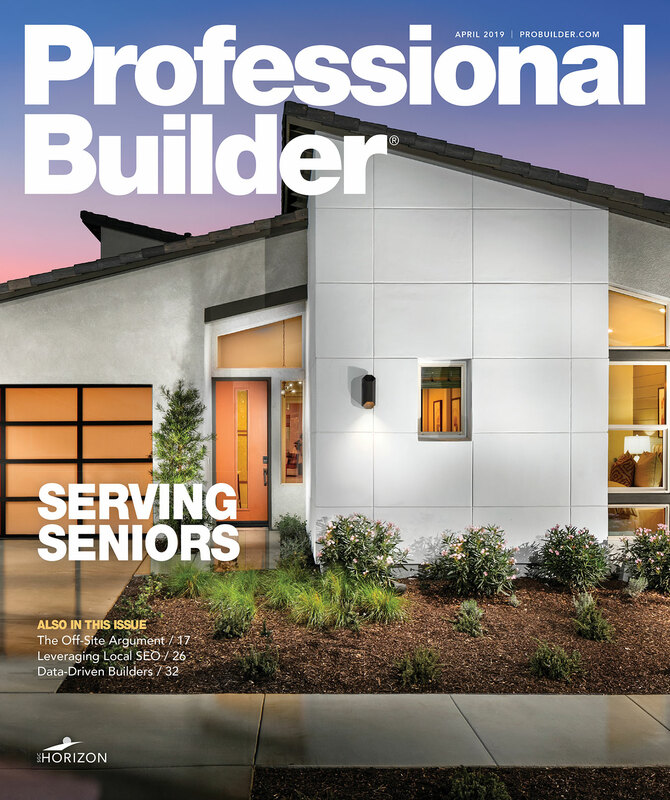 It’s true that Toll Brothers is the only company to twice be named Builder of the Year by this magazine. But 1988 was a long time ago, and at that point, the recognition was focused primarily on Bruce Toll and Robert Toll, who founded the company in 1967. This award has long since stopped being about individuals and has focused more on company achievements. And the achievements of late have been remarkable. Many other large builders have managed through the historic downturn quite well. For that matter, so have many small- and mid-sized companies. But Toll Brothers today is arguably at the top of the industry when it comes to its cash position, its leading land positions across the country, its access to and extremely low cost of capital, the strength of its brand, the experience and tenure of its people, its high levels of quality and customer satisfaction, and its ability to execute against a long-term product diversification strategy that is working well and is one that holds great promise for the years to come. 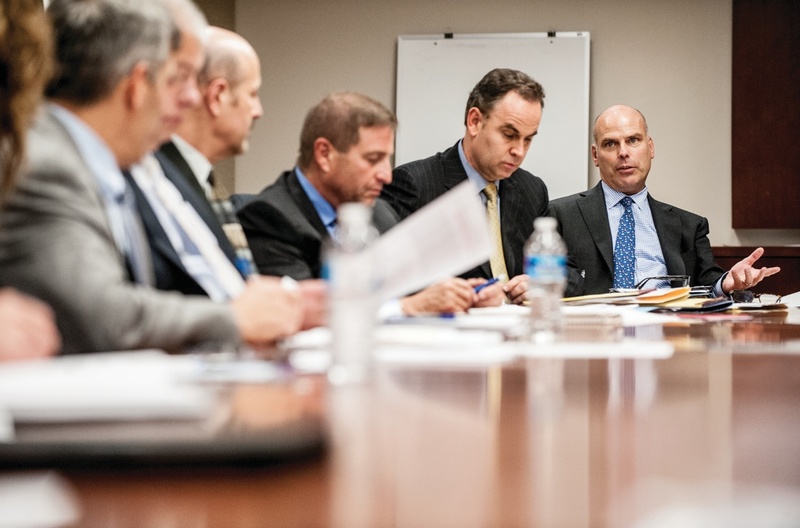 Until May of 2010, when Doug Yearley was named chief executive, top management for many years had consisted of Bob Toll as CEO and chairman, Zvi Barzilay as president and COO, and Joel Rassman as CFO and treasurer. Their stewardship of the business was greatly admired and influenced many builders and other outside professionals who wanted to learn about the home-building industry. Several top investment analysts who cover home building today cite the tutelage of Joel Rassman in helping them initially learn the business. Sadly, Rassman passed away in the fall of 2010 and was replaced by Martin Connor, whose deep familiarity and close working relationship with the company stemmed from his two years working directly for Rassman in anticipation of the transition and, prior to joining Toll, as the lead partner for Toll’s outside auditing firm. And it was about one year later that Rick Hartman was promoted to COO, succeeding a retiring Barzilay. Hartman has been with the company since 1980, and Yearley since 1990. Such tenures are not atypical at Toll. In an era when people move from place to place without compunction, these individuals choose to stay and remain immersed in home building. And that, say many, is a testament to Bob Toll, who remains as executive chairman and who consistently hews to a myriad of learned axioms about home building that keep the daily work of the company’s employees quite focused on the ground-level business that must be executed week-in and week-out. A comparison of Toll Brothers today versus 1988 — the last time they captured Professional Builder’s Builder of the Year honors. Anyone visiting the Toll headquarters in Horsham, Pa., on a Monday night should expect to see the executive team and many others working late. It is a tradition, a way to unite the company in real time across many time zones. Project managers, for example, in California and Arizona know that they can reach out to the home office for specific quesitons and expertise on Monday nights. The whole package — Monday office hours, professionalism, and long tenures — speaks to a deep reservoir of employee engagement and pride. Among construction-management graduates, the company is known to hire only the best, with competitive compensation packages and benefits that include use of company owned vacation properties, notes Jon Downs, SVP of human resources. Through the downturn, when the company (like all other builders) had to dramatically reduce headcount, and now in the upturn, as more people are needed, Downs has managed Toll’s staffing needs. The company, he says, has recruited back 600 former employees, many of whom left jobs to return. A thorough review of sales figures and potential land deals exemplifies the company’s core conservative methods and processes. They deserve part of the credit for Toll’s leading position as the market improved this year, and the reason why this magazine believes the company is positioned well for the upturn. 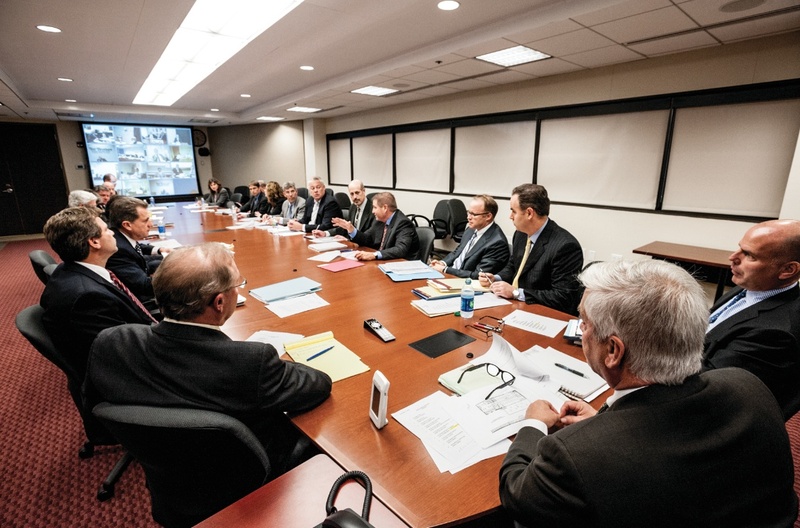 While project managers, divisional heads, and regional presidents for Toll have a lot of authority over how things get executed, decisions on land and community pricing still merit the close scrutiny of Yearley, Hartman, and Bob Toll. Land-deal briefs come to the executive team on Fridays so they can be reviewed over the weekend for a Monday meeting. Ninety percent of those deals get approved, but all division presidents supporting those deals come out with questions that need to be resolved first. “They go out of the meeting with a greater understanding of the community that they brought us for approval. We will say, ‘We don’t think this comp is accurate. You don’t support this pace. Yes, you say they sold seven homes in the last month, but if you look over the last two years, they have done 14. So something is not making sense,’” Bob Toll explains. Being a publicly traded company has numerous benefits, chiefly low-cost access to capital. About the time Hurricane Katrina hit New Orleans in the late summer of 2005, Toll Brothers executives, says Bob Toll, began “seeing the movie” they had seen preceding other downturns. Beginning in 2007, they scaled back their land purchases and they continued to do so for two or three years, at the same time selling homes on existing lots. Through that process, the company built up its cash position from approximately $600 million to nearly $2 billion, says Connor. In 2004, Toll Brothers ventured into a segment of the residential construction business that few traditional production builders dare to enter — inner-city mid- and high-rise living. The company’s first foray into urban multi-family development was the 325-unit, 17-story Sky Club luxury complex in Hoboken, N.J., which sold out in two years. Today, Toll Brothers City Living has projects in half a dozen metro markets throughout the Northeast, including Manhattan and Brooklyn in New York; Hoboken and Jersey City in New Jersey; and Philadelphia. Recent projects include The Touraine, a 22-unit building in Manhattan that sold out in just four months; 205 Water Street in Brooklyn (see pictures), which sold all 65 units in a year; and 1450 Washington Street, a 157-unit development in Hoboken that is nearly 80 percent sold out. The company’s move into urban living was spurred by the up tick in the number of past Toll buyers that, upon becoming empty nesters, were downsizing and moving to more urban areas. The division has grown to represent about 15 percent of the company’s home-building business, and CEO Doug Yearley is looking for that piece of the pie to stay strong. “It’s largely an untapped market for us across much of the country,” says Yearley, adding that a major source of revenue growth for the company moving forward will be expanding its diverse set of products, including urban living, to more divisions. As a public company, they had for many years created a massive pool of liquidity by selling bonds and staggering the maturity dates in a process called laddering. Their cost of borrowing hundreds of millions averaged near 6 percent throughout most of the toughest years for home building. Furthermore, with all of the company’s cash on hand, Toll was one of very few builders that was able to consistently maintain a significant line of credit during the downturn. Currently, a consortium of 12 lenders around the world maintains a $900 million facility with the company. Toll’s head of investor relations and SVP of finance, Fred Cooper, says the firm tapped that credit line only sparingly, as a function of facilitating land deals as the market began to hit bottom. Perhaps the crowning achievement from a financial management perspective came late this past summer when the firm successfully accessed the convertible bond market in a $287 million deal that was announced just after Labor Day. The terms were 0.5 percent interest (one-half of one percent) over 20 years. Bond holders are betting that the stock price will grow 50 percent in the next five years enabling a potential 10-15 percent overall return. Not only was it a huge vote of confidence in Toll Brothers’ stock, but it also showed investor confidence in home building generally. 1977 George S. Writer, Jr. These are the advantages of being a publicly traded home-building company, particularly those companies that are well regarded by the investor community. John Burns, the respected head of the real estate consultancy that bears his name, recently blogged about the huge advantage public builders have when it comes to accessing low-cost capital. But the benefits of being a public home builder did not always seem so clear in 2000, when public builders were trading at sickeningly low levels versus earnings. At the time, dot-com stocks were taking all of the air out of the room. Home-building stocks were respected only as trading vehicles to be held during an upturn in housing and sold soon after. IR chief Cooper took the time to explain, to this magazine, the error being made by investors in thinking of home-building stocks this way. Way back in 2000, he pointed out that leading home builders like Toll had become more professionally managed, that they could weather the downturns and emerge on the other side making profits. Neither he nor anyone else knew the extent to which this theory would be tested. But, by and large, Toll Brothers did exactly what they said they would do. Operating on an October 31 fiscal year, Toll this year is likely to show an increase in revenue of 40 percent or more, with commensurate growth in profitability. And with all of that capital behind them, they are uniquely positioned to buy more land. On top of owning or controlling perhaps the best land positions of any builder, they get to see all of the deals and to be selective, notes Yearley. A recent analysis of land holdings by John Burns Real Estate Consulting ranked top builders according to the quality of their land holdings. They call their analysis the Submarket Desirability Index. The higher the index, the better the land positions. Toll Brothers came out No. 1 in this analysis, followed by M/I Homes, Ryland, PulteGroup, K. Hovnanian, Meritage, Beazer, Standard Pacific, Lennar, D.R. Horton, NVR, KB Home, and M.D.C. Holdings to round out the top 13. According to Yearley, this enviable bank of land is less about a grand plan than it is about the aforementioned rigor they apply to buying it. If anything, he says the company may have missed some opportunities in California in the early 2000s when they shied away from deals in markets where prices kept escalating. For him, it goes back to the company’s innate financial conservatism. Monday, November 5, 2012, was a big night in Philadelphia. The hometown Eagles were set to take on the New Orleans Saints in a primetime Monday Night Football matchup in Louisiana. It was one of those crucial games that could determine the fate of either team’s season. For more than 25 years, Toll Brothers has relied on component manufacturing to ensure their homes are built right every time — and on time. Bob and Bruce Toll learned early on that as their operations ramped up, they could gain efficiencies, reduce waste, realize cost savings, and assemble a better product by constructing a significant portion of their homes in a factory environment. In the mid-80s, they partnered with local component manufacturers to produce wall panels and roof trusses for their projects in the Northeast. In 1988, they decided to bring the operations in house with the launch of a facility in Morrisville, Pa.
Today, the company’s component manufacturing division, Toll Integrated Systems, includes three plants — the original location, as well as factories in Emporia, Va., and Knox, Ind. — that combined serve about 50 percent of Toll’s home-building business with roof trusses, wall panels, exterior trim, exterior doors, interior millwork, select windows and window screens, hardware, and other components. Together, the factory-assembled components make up on average 25 percent of the hard cost of a given home, according to Rob Parahus, regional president running home-building operations in New York, New Jersey, Connecticut, and Massachusetts, and head of Toll Integrated Systems. Parahus says there are a number of tangible benefits to running an in-house component manufacturing facility, including faster construction, less waste, higher quality, and better control of the supply chain. In addition, by using components versus stick-built, Parahus says Toll’s trade partners can frame a project (from foundation to under roof) in anywhere from five to 10 days — roughly half the time it would take a typical stick builder. And the end product meets Toll’s high-quality standards. At the Toll Brothers headquarters, 17 miles north of the city, the office was abuzz with energy. But the big game was the last thing on the minds of the 100 or so Toll employees in the company cafeteria around 6:30 p.m. Same goes for the dozens of executives and key staff members seen huddled in meeting rooms, working in their offices, or walking the halls of the building. If we didn’t know any better, we would have thought it was noon, not early evening. “Yes, every Monday night is like this,” said Yearley, as we ate dinner in Toll’s fully stocked cafeteria. Yearley, a 22-year Toll employee, reminisced about the early days of the company’s legendary Monday night meetings, when Bob and Bruce would send out for pizzas or, on special occasions, Boston Market, to feed the then-small staff as they worked into the night discussing the previous week’s sales numbers, land deals in the works, community issues, and other key company business. Of course, the company is much larger these days — 2,396 full-time employees, as of late October — but the Monday night meetings have remained a mainstay at every level of the company. And yes, the Tolls still pop for dinner. 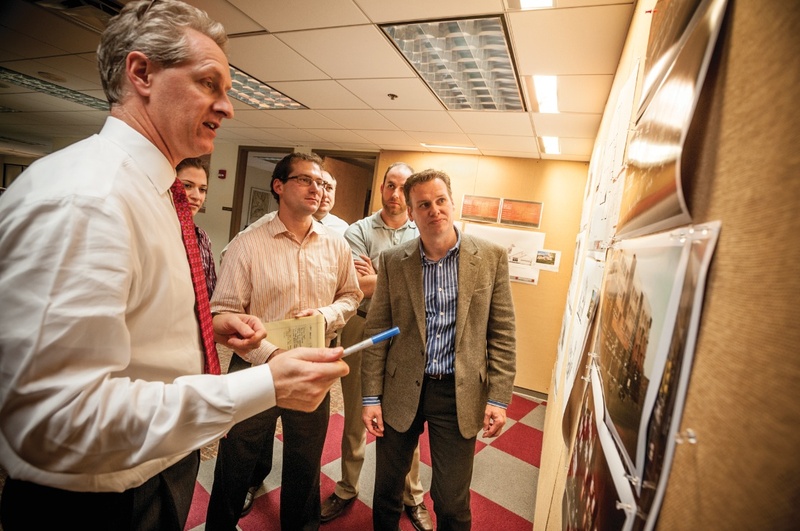 Perhaps no other Toll Brothers business practice exemplifies the company’s corporate culture — where employees are taught the business from the executives who built the business through continual mentorship and shared learning — more than the Monday night meetings. It’s when the entire company comes together to assess the business, work through issues, make tough decisions, and learn from each other. Toll employees talk about the Monday night meeting with a sense of pride and company spirit. It’s a rite of passage of sorts. Yearley can even recall the number of Monday nights — roughly 800 — he participated in before he was deemed ready to take the helm as CEO. “I remember nights waiting outside Bob’s office at 10:30 to catch a few minutes with him,” says Yearley. This culture of mentorship, learning the business from the ground up, and coming together for a free exchange of ideas, has created an extremely rewarding work atmosphere at all levels of the company. This is evidenced by the unusually long tenure of Toll employees, especially at the management level. The average length of service for division presidents is 12 years, group presidents 17 years, and regional presidents an astonishing 25 years. “It’s what keeps me coming back. I want to be challenged and always growing,” says Kira Sterling, Toll’s chief marketing officer, talking about the spirit of continual learning, shared knowledge, and entrepreneurship that exudes throughout the company. They are qualities derived from the company’s founders. Toll operates using a vertically integrated business approach, where centralized departments (home finance, marketing, architecture, engineering, component manufacturing, lumber, insurance, title, mortgage, landscaping, home security, legal, IT, etc.) service the divisional home-building businesses. By operating these services in house, the company can better control costs and schedule while also maintaining a high level of quality and customer service. To ensure that all vertical support businesses remain focused on the customer — Toll’s home-building operations — the company puts its operations heads in charge of the vertical units. While the tactic may seem a bit off base at first — for example, Toll’s IT department is headed by a career home builder with degrees in mechanical engineering and finance, Barry Depew — this “boss as the customer” approach has paid dividends for the company. “We want them to be accountable to the people they support,” says Yearley. Each home-building division is operated as an autonomous unit, with its own profit and loss responsibilities, save for three critical areas: price setting in new communities; price changes of significance in existing communities; and land acquisition. As stated earlier, Bob Toll has remained steadfast on centralized control of these facets of the business; he, along with Yearley and Hartman, review all land-deal proposals and home-price decisions and have the ultimate say. Bob Toll’s attention to detail goes even deeper. It’s not uncommon to see him walking communities, picking up pieces of trash along the way. It’s a leadership quality that is infectious. “I used to have a buddy that said all the time, ‘The big things, they’ll take care of themselves; it’s the small things that will kill you.’ This business is all about the details,” says Toll. Case in point: Every Sunday night at about 9 p.m. Eastern, Bob Toll (along with all senior executives) reviews a detailed sales report that breaks down the prior week’s activity at each Toll Brothers community across the country. It’s a practice that dates back to the earliest days of the company, when he would call his sales managers individually and jot down key sales metrics — deposits, agreements, number of lots for sale, cancellations, traffic, etc. — and get the story behind each customer from that week. The central element of the development of a brand is consistency. Everything a company does and says needs to line up with the message it presents to the public. To maintain a brand position of “America’s Luxury Home Builder,” Toll Brothers has to be extraordinarily conscious of everything it does, from the location of the land it buys and its corporate sponsorships to its incentives and the move-in gifts for its new homeowners. Toll Brothers is formed by brothers Robert and Bruce Toll in Horsham, Pa. Over time, they earn a reputation as the region’s dream-home builder. The company expands in the central New Jersey upscale housing market. This marks the beginning of its regional expansion. The company enters the country club market with Blue Bell Country Club in Montgomery County, Pa. The community features an Arnold Palmer Signature Golf Course. This begins Toll Brothers’ affiliation with internationally known golf course designers. It now has golf communities in 12 states. The New York division opens. The company’s position as a luxury home builder in the Northeast and Mid-Atlantic is firmly established. Company enters the Sun Belt second-home market “in a big way,” according to CMO Kira Sterling. It expands into North Carolina and California in 1994 and Arizona, Florida, and Texas in 1995. & Associates, Inc., a luxury home builder in Scottsdale, Ariz.
Toll Brothers opens Riviera at Westlake in Jackson, N.J., its first active-adult community. This allows Toll Brothers to follow the baby boomer market, a key target buyer for the builder. The company changes its logo and its positioning statement from “Toll Brothers, Quality Homes By Design” to “Toll Brothers, America’s Luxury Home Builder.” This officially differentiates the company as focusing on the luxury end of the production home-building business. The company launches “Fly and Buy,” a program to fly prospective buyers to experience the lifestyle at second-home communities. This demonstrates the relative ease of reaching the destinations in a short amount of time to maximize use of the property. Toll Brothers enters the urban, luxury high-rise market with the introduction of the City Living brand. This gives the company access to the luxury, high-rise tower market and status with wealthy urbanites. Toll Brothers announces its first — and only — national sponsorship, the radio broadcast of the Saturday matinee of the Metropolitan Opera. This is the longest-running classical music program in the history of American broadcasting. The program is broadcast on the Toll Brothers-Metropolitan Opera International Radio Network over more than 300 stations in the U.S. It reaches 11 million people in 42 countries. Toll Brothers opens its New York City division. This gives the company a high profile with Wall Street investors and analysts and helps diversify the company, providing stability as suburban locations start to falter. The company’s Web team transitions from being under the control of Information Technology to reporting to CMO Kira Sterling. This recognizes the importance of Internet marketing to prospective home buyers and ensures that the company’s brand remains consistent from a buyer’s first introduction to the company to post-closing. Toll Brothers formalizes its active-adult offerings as a brand with the launch of Toll Brothers Active Living. Toll Brothers purchases CamWest in Seattle. This completes its position of having a presence in the 15 most-affluent markets in the country. The last part has been fairly easy to accomplish. Nothing says luxury like a gift that arrives in the famed blue box from Tiffany’s. But it’s not a standardized item like a logo keychain for the house keys or a crystal vase filled with fresh flowers. Within a couple of weeks of moving in, the sales consultant hand delivers a Tiffany gift selected especially for them. The front end of the value proposition — location — has always been the most difficult to manage. No one’s making any more land. Toll Brothers defined its position unequivocally when it entered the Manhattan high-rise luxury tower market. Its latest offering is The Touraine, a condo project at 65th and Lexington Avenue, just blocks from Tiffany’s flagship store in Manhattan. Toll Brothers has made a point of associating with well-known, highly respected brands as part of its sales and marketing strategy. Its website devotes a section to the brands it uses in its homes, including Kohler plumbing fixtures, Jenn-Air and Viking appliances, and Bose sound systems. The golf courses at its country club communities are designed by the top names in the business, including golf legends Arnold Palmer and Greg Norman. “Having these celebrities appear at the courses doesn’t hurt either,” Sterling notes. Getting into golf communities was just one of the strategic sales decisions made by the 2012 Professional Builder of the Year, but it’s one that exemplifies the brand. Toll Brothers not only builds the houses but also manages the courses and the amenities. Its golf and country club division runs 12 courses that include full-service clubhouses with swimming, tennis, and fitness centers. Just as some builders opt to target first-time or move-up buyers, Toll Brothers made the decision in the late 1970s to target luxury home buyers — baby boomers who were building their careers and their wealth or had benefited from the generational transfer of wealth from parents who grew up in the Depression and World War II. Those buyers had sufficient funds for second homes in Sun Belt locations, including Arizona, Nevada, Florida, California, and the Carolinas. Toll Brothers took advantage of regular, reliable air travel and launched “Fly and Buy,” a promotion that gave prospective buyers a chance to sample the lifestyle. It showed buyers how easy it was to spend a weekend in the sunshine with family and friends. As the baby boomers aged, Toll Brothers developed active-adult communities for them. It got into that market in 1999 with Riviera at Westlake in Jackson, N.J. The key was being able to offer a different experience than the minimalist, budget-minded senior citizen community of the past. Sponsorships are another key part of any corporate branding strategy. As part of establishing itself as a legitimate option for ultra-luxury, urban home buyers, Toll Brothers announced its sponsorship in 2005 of the Metropolitan Opera’s radio broadcast, the longest-running classical music program in the history of American broadcasting. Broadcast on the Toll Brothers-Metropolitan Opera International Radio Network over more than 300 stations in the U.S., it reaches 11 million people in 42 countries. To date, Toll Brothers hasn’t pulled the trigger on two brand strategies that might seem like a good fit. They haven’t aligned themselves with a well-known designer, such as KB Home’s collaboration with Martha Stewart, or a luxury car manufacturer. Unlike many builders, Toll Brothers has an in-house marketing and advertising, Web, and graphics team. Recent ads have included a red carpet theme, mini-profiles of homeowners who exemplify the buyer profile, and an “I Wish I Had” campaign that spoke to the experiences that would be lost by postponing a purchase. More than anything else, the message has been consistent. Five over four and a door. It’s one of the simple design formulas that have served Toll Brothers well for decades — a colonial-style home with five windows over four windows and a door that can be customized with rooms on either side. Bob Toll says the home style has been a winner among Toll buyers dating back to the mid-70s. It’s indicative of the type of product the company has become known for — spacious, four- to five-bedroom, two-story, single-family detached houses with well-detailed elevations. But through the years, the company has greatly diversified its product range to include everything from 500-square-foot, inner-city condos to 8,000-square-foot estate homes, and from ranch-style active-adult models to high-rise buildings. So, is there a Toll “look” anymore? Weber says every design created by Toll Architecture (and third-party firms) is scrutinized to the nth degree by the operations team, both at the design table and in the field, to ensure they meet Toll’s standard of quality. Once a design passes the paper test, a full-scale, physical model is built in the community for which it’s designed. There, the local operations team conducts a framing inspection with the trade contractors who built the model, as well as the local sales team, designers involved in the project, and even homeowners from the area. Incorporate memory points. Whether it’s a dual staircase, wall of windows, or grand kitchen island, each Toll plan is designed with at least one landmark feature that will likely cause a home shopper to recall the home later. Don’t skimp on products. “We’ve learned not to skimp because inevitably you end up paying twice as much in warranty than if you just spent a little more upfront,” says Gibson, citing the use of cellular PVC trim as an example. He says that Toll designs typically exceed the code minimums, especially with regard to structural design. For example, as standard, the builder beefs up the floor structure in the kitchen to allow homeowners to install marble tile down the road without worrying about cracking due to deflection issues. Flexible plans. As a semi-custom builder who sells more than $100,000 on average in structural and design options per home, creating plans that can adapt to a home buyer’s wants is essential.